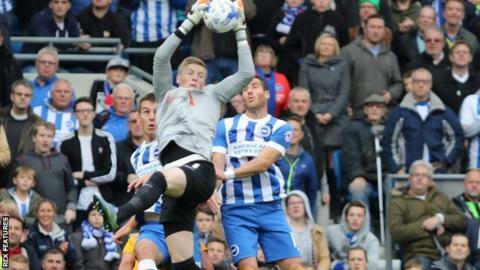 Championship leaders Brighton & Hove Albion were held to a disappointing goalless draw by Preston North End. Despite failing to score for only the second time this season, the Seagulls remain unbeaten in the league. Preston striker Joe Garner had a header cleared off the line in a dogged and uninspiring second period. Brighton have now won once in their last nine games with Preston in all competitions, drawing four and losing four. Gaetan Bong limped off late on for Albion, leaving them down to 10 men for the eight minutes of stoppage time. North End deserve credit for shutting out Brighton on home turf, stifling their attacking threats and troubling them on occasions through the creativity of Paul Gallagher. Few efforts were worthy of the phrase 'shot on goal' even in the brighter first half, as Baldock had an effort blocked and Jamie Murphy's free-kick was dealt with by Jordan Pickford. At the other end Eoin Doyle's header from a Gallagher cross was stopped by David Stockdale. There was even less to shout about in the second period and not even the introduction of Brighton striker Bobby Zamora, with two late winners in the last two games, could liven the encounter. Garner's header was the best effort, nodded away from danger in a stalemate. The Seagulls remain four points clear at the top of the table and are the only undefeated side in the top four tiers. "We have characters in the side. "We weren't at our best today and last season this was a game we would lose. We'd rather have the challenge of teams wanting to beat us and the longer it goes on, the tougher it will be." "We have said all season that we've played very well. We have been involved in every game but not had the results. "But now we are gaining in confidence. Our 3-0 away win at Charlton in midweek was a really good performance and we tried to get three points at Brighton." Match ends, Brighton and Hove Albion 0, Preston North End 0. Second Half ends, Brighton and Hove Albion 0, Preston North End 0. Attempt missed. Joe Garner (Preston North End) right footed shot from the centre of the box is too high. Assisted by Paul Gallagher with a cross following a corner. Attempt blocked. Paul Gallagher (Preston North End) left footed shot from the centre of the box is blocked. Assisted by Adam Reach. Corner, Preston North End. Conceded by Danny Holla. Jordan Hugill (Preston North End) wins a free kick on the left wing. Attempt missed. Adam Reach (Preston North End) left footed shot from outside the box misses to the right. Assisted by Paul Gallagher following a corner. Corner, Preston North End. Conceded by Andrew Crofts. Gaëtan Bong went off injured after Brighton and Hove Albion had used all subs. Marnick Vermijl (Preston North End) is shown the yellow card for a bad foul. Substitution, Brighton and Hove Albion. Danny Holla replaces Jamie Murphy. Jamie Murphy (Brighton and Hove Albion) wins a free kick on the right wing. Attempt missed. Rohan Ince (Brighton and Hove Albion) right footed shot from outside the box is high and wide to the right. Assisted by Andrew Crofts. Andrew Crofts (Brighton and Hove Albion) is shown the yellow card for a bad foul. Attempt blocked. Joe Garner (Preston North End) header from the centre of the box is blocked. Assisted by Paul Gallagher with a cross. Attempt blocked. Daniel Johnson (Preston North End) left footed shot from the centre of the box is blocked. Assisted by Paul Gallagher. Delay in match Rohan Ince (Brighton and Hove Albion) because of an injury. Corner, Preston North End. Conceded by Jamie Murphy. Attempt missed. Sam Baldock (Brighton and Hove Albion) left footed shot from the left side of the box is too high. Substitution, Brighton and Hove Albion. Solly March replaces Liam Rosenior. Substitution, Preston North End. Joe Garner replaces Eoin Doyle. Attempt missed. Greg Cunningham (Preston North End) header from the centre of the box misses to the right. Assisted by Paul Gallagher with a cross following a set piece situation.